300SL, decode the name and you have figures and letters that denotes an automobile of three liters that is both sporting and light (Sport Leicht). What Mercedes-Benz ended up constructing was a no compromises machine aimed at racing, a showcase of innovative technology, and an inherently flawed car that was dripping with exotic style. Mercedes-Benz had assembled the first supercar. Defining the term supercar has always been a philosophical debate, and the line between a sports car and supercar can quickly becomes hazy. There has never been an agreed upon single quality that constitutes a true supercar and the definition will always be a combination of many quantitative and qualitative elements. These facets usually fall neatly into two separate buckets of reasoning, a split that creates the core rationalization for the divided and enthusiastic debaters of the subject. The first bucket of reasoning is bristling with that of a racer’s rationalization; that a supercar should never be as accessible as a sports car. It must transcend not just the meager capabilities of other road going cars, but the capabilities of the driver (no matter how experienced they might be). Impossible to master or tame, a supercar should have absolutely no understanding of practicality or concern for creature comforts. Engineering should drive its development with a culmination of profound technological strengths providing the best solutions to achieve pure performance. No marketing department is needed, because a racer’s supercar does all its talking at the track. This is an uncompromised, yet street legal, racecar. The flip side of the debate revolves around evoking emotion and how supercars should garner the unbreakable attention of anyone who beholds it. Absurdly powerful, loud and gorgeously designed cars that deliver a sense of occasion; flawed cars that make no apologies for their shortcomings (only adding to their quirky charm). In this rationale, to paraphrase James May, a supercar should give you that fizzing sensation in your pants. An exotic should be dripping with panache. 300SL Gullwing – Part racecar. Part exotic. All supercar. Supercars following the rubric of either line of reasoning should sit at the top of the manufacture’s product lineup, acting as the halo car or physical embodiment of the brand. A supercar is always bespoke, custom fitted to the owner, exuding a sense of craft and passion. So, how can both sides of the debate get along? A car that can manifest the qualities outlined in both schools of thought is certainly worthy of the supercar classification. Otherwise you are left with just a racecar, or just an exotic. Enter the Mercedes-Benz Gullwing. 3.0L Sport Leicht (sport light), while only the feebleminded would debate the first two claims designated by the 300SL moniker, the third presents a vital reminder that technological advancements are defined and intertwined with a point in time. At 2,888 pounds the 300SL was still considered light in the mid 50s and early 60s, but far from a featherweight even by today’s standards. This relative lightweight holds especially true when compared to the later classic American muscle cars initially labeled “supercar”. Being lightweight may have been a debatable quality of the Gullwing, but its sporting prowess was not. 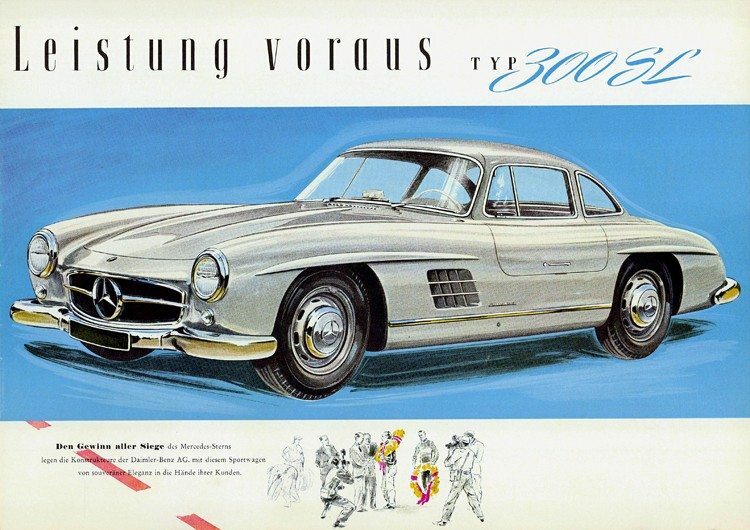 The 300 SL featured direct fuel injection, aluminum body panels, a tubular spaceframe chassis, four-wheel independent suspension, and a 161 mph top speed. Even today, those are rare characteristics to find blended into one car. In 1954, they were nothing short of revolutionary. These innovations were originally spawned by the desire to go racing. The Mercedes-Benz 300SL W194 was the racing car predecessor of the later road going version that would become internally designated as the W198. In 1952-53 the 300SL W194 racecar experienced phenomenal racing success taking a second and fourth place finish at the Mille Miglia debut. At Le Mans the car delivered a stunning first and second place finish, then a podium sweep (1st, 2nd, 3rd) at the legendary Nürburgring. Thanks to Max Hoffman, the majority of the 1400 Gullwings built were sold in the United States. Forged in the fires of racing, the production car carried over the same uncompromised design of the W194. It sported a 3.0L inline six-cylinder engine that was canted over at almost 40 degrees; allowing for a stunningly gorgeous and low hood line that was instrumental in increasing aerodynamic efficiency. 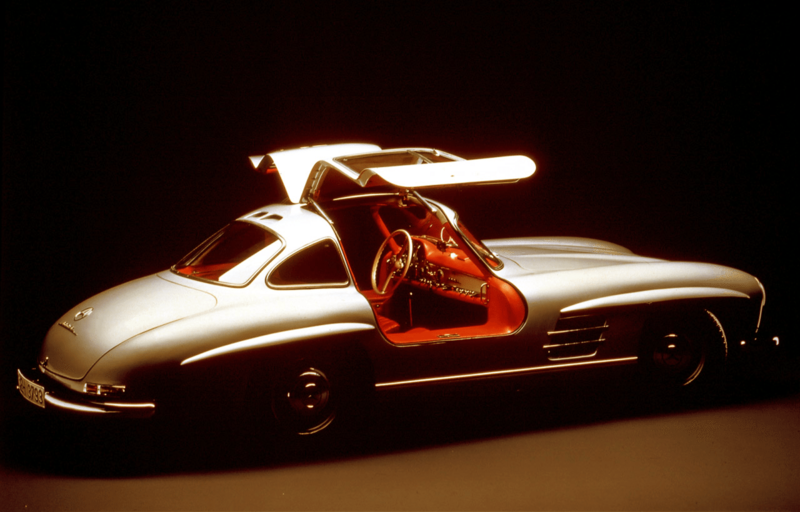 The trademark gullwing doors were an engineering work around to prevent cutting into the doorsill area and altering the rigid, yet lightweight, tubular chassis underneath. Arguably the most important advancement that the road going 300SL held over the racecar was the introduction of fuel injection; actually direct injection. 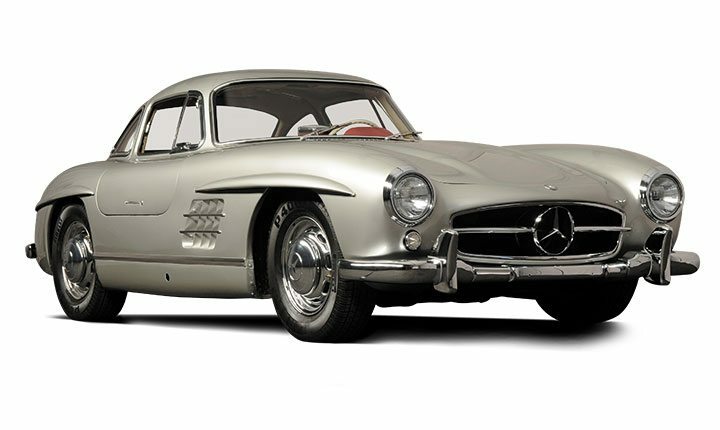 The Gullwing was the first production car to implement this technology, helping to bump the output of the engine up to around 230 horsepower (vs. 170 in the carbureted racecar). This turned out to be an inherently flawed mechanical injection system that was known to continue to pump fuel during the few cycles it took the engine to come to a complete stop after shutoff. Gasoline would then seep into the engine oil, diluting it. The best solution to this problem . . . drive the car long and hard in order to generate temperatures high enough to burn off, or evaporate, the rogue gasoline. So the car was powerful, light, and brimming with proven racing tech. It was uncompromising with an inherent an unapologetic flaw. It was also drop dead gorgeous. It was a supercar. The low hood and rearward cab created a striking silhouette that was accentuated by bold fender accents and gills. The bodywork was carefully crafted to achieve the most aerodynamic contour of the time, and in a rare instance of form following function being a good thing, it was one of the most beautiful cars of all time. Aluminum was heavily used in the construction of the chassis and engine, but a rare 29 cars (of the roughly 1400 sold) were clad in all aluminum body panels. This extensive use of exotic materials was made more impressive by the attention to detail and excellence of craftsmanship. Let’s not forget those doors, those incredible gullwing doors. Sure they were an engineering solution to retain the triangulated tubular alloy chassis, but when opened they generated wonderment in all who witnessed. This was an incredible departure in automotive design that put the 300SL in an orbit all it’s own. Only Ferrari was making cars this stunning. The 300SL Gullwing is a classic collectors car that will forever embody the merits present on both sides of the debate, a forefather to the modern day supercar. It’s a racing car for the road with a style that commands your attention and inspires awe. It’s the original supercar. Not all will agree, most will argue, and that is the beauty of being a car enthusiast. So, what do you think defines a supercar? What would you pick as the original supercar?